For September, we read, "Mr. Penumbra's 24-Hour Bookstore" by Robin Sloan. 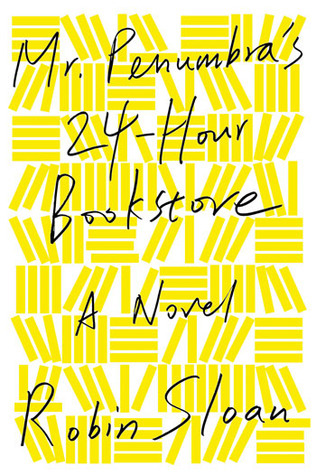 The novel is about a unemployed graphic designer who finds work at a mysterious bookstore with an eclectic patronage. While uncovering the centuries-old secrets hidden amongst the bookshelves, the protagonist finds modern day romance and unlocks more than he ever could imagine. All of the participants agreed that it was a really engaging and funny novel. For our purposes, some participants easily found inspiration and others struggled to find imagery that piqued their muses. As always, it was a really fun meet-up! You can't really see it, but I'm wearing a black robe. (Several of the other members had black robes as well, but got too hot and took them off before the picture was taken.) Members of the Reading Room wear the black robes. We had quite the feast of sweets! Since my birthday (and Dawn's birthday) recently passed, we celebrated with a cake! (Thank you Aunt Peggy!) Amy picked up lots of frozen yogurt from the creamery as well! Laurel Ross made this project. Here's what she had to say about it: "In the book there's a set of printing blocks, which turns out to be very important. I saw these oversized letters and thought this would be perfect. Along the edges and on the back, I inscribed an saying near and dear to my heart. My kids wanted to get in on the fun and they also decorated their own letters! Check out her blog HERE." Dawn Berkebile made this piece. Here's what she said about it: "While I liked the book a lot, I couldn't find anything that really jumped out at me. I thought about the dark, underground Reading Room and decided to make a necklace that captures the cold stone and warm wood." I made this piece. 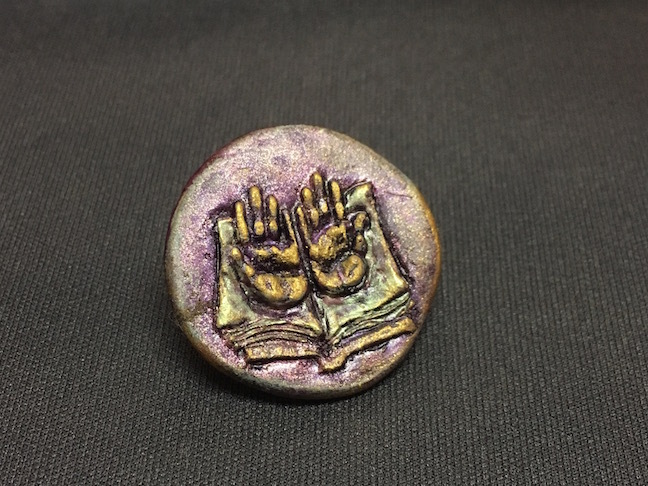 It's a pin made from polymer clay. I carved the mold and pressed out the piece and then painted and embellished it after it had cured. The open hands over the book are a symbol of the bookstore and the mysterious group. 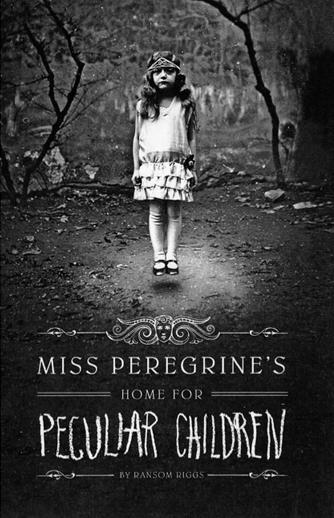 "Miss Peregrine's Home for Peculiar Children" by Ransom Riggs is up next for October! CLICK HERE to see the full list of books for the year. 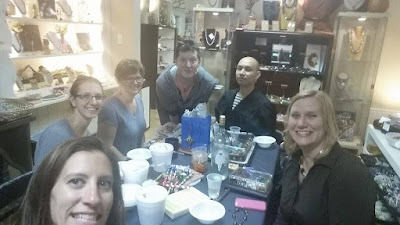 The in-person meet-up is tentatively scheduled for Wednesday, October 28th. The blog hop is scheduled for the following day. I've heard a lot of people say how much they love this book, so hopefully lots of folks who have read it will participate! If you're interested in keeping up with what we're doing, CLICK HERE to visit our Facebook group. Looks like another fun night at Allegory Gallery! 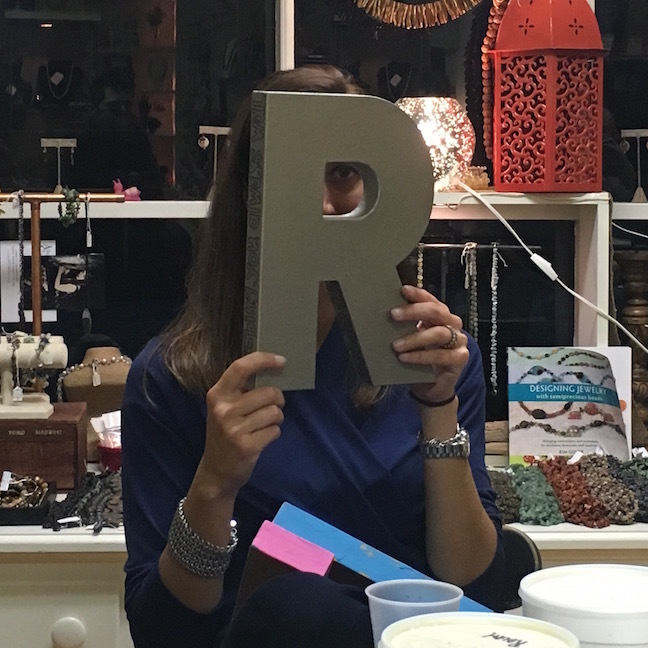 I love that Laurel's piece is literally letters! The beads in Dawn's necklace have such a lovely glow to them. And I get her feelings about finding it difficult to turn the reading experience into a concrete creation...maybe that's why I sometimes go very literally. Andrew, I always love to see what you come up with, especially when you create a special component like this time. Love what you did with the open hands! Andrew...You know that Sj and I want one of those pendants right? Looks like you all had some fun at the meet up. Really like your polymer clay pen with the symbolic image. Dawn's necklace was meaningful and I thought Laurel use of the letter was fun. Plus I enjoyed the book. Happy birthday, Andrew and Dawn! Great projects. I love the originality, silvery glow, and saying of Laurel's letter. 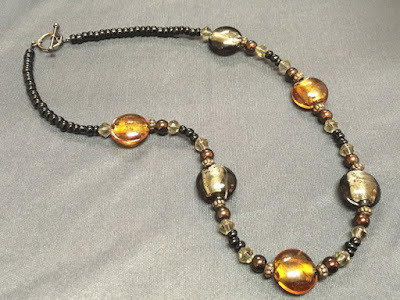 Dawn, beautiful warm/cool contrast in your necklace! 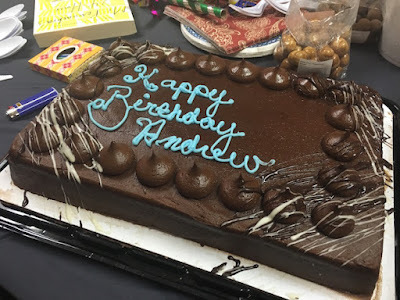 Andrew -- wow. The detail and swirling color of your pin just blows me away! Gorgeous. It always looks like a fun party, and doubly so this time with birthdays to celebrate! It's always fun to see when people make something other than jewelry, and Laurel's inscribed letter is very cool. Dawn's necklace is so pretty and does give the feeling of that hidden reading room. Andrew's pin is perfect! That was one of the most visual things about the book.